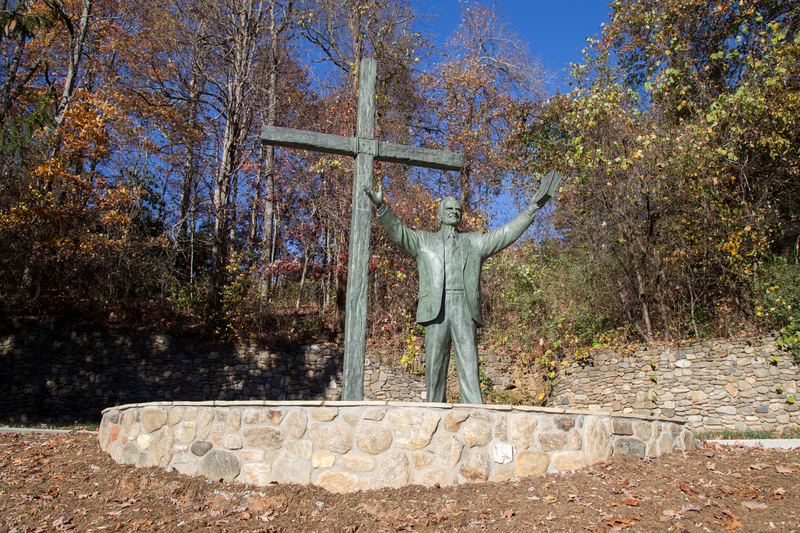 The Billy Graham statue at its new location at Ridgecrest Conference Center. 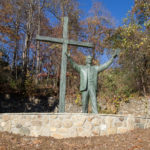 Nashville, Tenn.—A larger-than-life statue of evangelist Billy Graham has been installed at its new location at Ridgecrest Conference Center in the North Carolina mountains. The sale of LifeWay Christian Resources’ 14-acre downtown Nashville campus prompted the move from middle Tennessee to LifeWay’s conference center near Asheville, N.C. 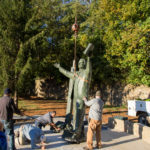 The statue was removed from LifeWay earlier this summer and placed in storage until the new site at Ridgecrest was ready. Workers installed the sculpture in October near the main entrance to the conference center, just a few miles from Graham’s mountaintop home. Bi-vocational pastor Terrell O’Brien’s sculpture depicts the evangelist in front of a 17-foot-cross with arms outstretched holding an open Bible in his left hand. At the foot of the cross are three nails and a stone inscribed with the words of John 3:16. Chris Fryer and Matt Samuelson, two Southern Baptist businessmen from Atlanta, donated the sculpture to LifeWay. It was unveiled at the 2006 Southern Baptist Convention annual meeting and placed on LifeWay’s Nashville property later that year. The Southern Baptist evangelist has preached the Gospel to an estimated 215 million people in live audiences in more than 185 countries and territories, with hundreds of millions more having been reached through television, video, film and webcasts. The author of 33 books, Graham has been listed by Gallup as one of the “Ten Most Admired Men in the World” for 53 straight years and 59 years total. Now in frail health, he recently celebrated his 98th birthday in the western North Carolina home he shared with his wife, Ruth, who died in 2007, and their five children. Workers installing the Billy Graham statue at Ridgecrest Conference Center.